Will the UK-Russia Year of Culture warm up frosty relations? In order to appeal to the stock-ticker-watching generation of investors, art has been subjected to much attempted classification and analysis in recent years, not least of all the creation of indexes to demonstrate patterns, suggest future performance and provide comparisons to other potential investments, most of which are measured in this way. It must be noted, however, that unlike in the equity, bond or even wine markets, art indexes are not traded (they do not reflect real-time activity); rather they collate historical prices, albeit in different ways. The demand for more finance-savvy products is twofold. Most galleries, all auction houses and many others in the art business are keen to pull in the cash of those who make money from other industries, in particular the increasingly dominant finance professionals (a simple case of following the money); and the latter are keen to identify themselves with the glittering celebrity offered by the art world. Art is accepted among the wealthy as an elevating hobby. This is not such a new dynamic — witness the post-industrial, self-made man’s raging appetite for Contemporary art in the 19th century — but we are now in an information age for which facts about money and markets have become one of the few universal and global languages, while the visual can (mostly) be understood (on a superficial level at least) anywhere. Hence record auction sales make good copy for the national press. The art history is left to specialists in the shadows — although this still (rightly) has an important impact on valuation, perhaps to the frustration of those who want to chart the market. As has been much recorded, the first major stumbling block when it comes to finding convincing patterns in art sales is the limited data available. The only publicly available information comes from auction (which at best represents 50 per cent of art sales). This information is recorded most comprehensively by one company, Artnet, which runs a database of historical public art sales prices from the major international auction houses since 1985. Access to this data, however, does not come cheap: the mid-level price (for 450 individual sale searches per year) was $976 in mid-2013. This is not to say that global stock market information contains the data on every business in every sector in the world, as not every company is publicly owned. But there are so many and they are of such a size (most of the largest, non-government-owned companies are publicly listed) that it would be surprising if they didn’t accurately represent a trend once the (now freely available) individual data is collated. The higher the volume of trades per company, per sector, per country and per market, the more accurate (or fair) its valuation will be. According to Artnet, there were 1.8 million fine-art works offered at auction in 2012 (and the average number of lots that go unsold is somewhere between 20 per cent and 25 per cent). By comparison, there were an average 576,000 trades per day on the London Stock Exchange in February 2013. The next stumbling block to an understanding of art’s performance as an asset is that it is what economists call a heterogeneous good. This basically means that each unit (work of art) is different from the other. While exposing some serious valuation problems, this also makes tracking performance (of an artist, an art movement or the whole market) inconsistent. This is not the case with shares, which are identical parts of a company. For example, on a per company basis, it is possible to see the performance of a company such as Vodafone over a specific period of time by looking at the movement of its share price. This then enables further analysis: Vodafone could, for example, be compared over the same period of time to another publicly listed telecoms company — say, BT. This would be the same for much smaller, but still public companies. When it comes to an artist, while it is perfectly possible to chart every work sold at auction since 1985 by Pablo Picasso, one of the most prolific artists, these would include, among many other categories, ceramics, prints, paintings and sculptures. Even if this were to be reduced to one medium (for example paintings), these would all be from different years and of different sizes, and would carry different art-historical importance. Some of them will be in better condition than others, some will have been part of an important collection (including a museum), others will be considered (relatively) immaterial, from the perspective of art history. All these factors will play a part in the price at which each work sells. By way of an example of how difficult these are to weigh against each other meaningfully, witness Piero Manzoni, an Italian avant-garde artist for whom — in theory — you would think it easier to create some sort of distinct subdivisions, certainly within his ‘Achromes’ (‘colourless’) series of works that he began in 1957 (these often look similar to each other). Two such pieces came up in the same auction at Sotheby’s on 26 June 2013 — lots 13 and 60 of the auction house’s Contemporary art evening sale, which both had Manzoni’s trademark crease lines formed by the effects of the colour-eliminating soft clay, kaolin, when applied to a canvas. The works, while similar, are not identical. 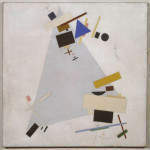 Lot 13, made around 1958-9, is smaller but known (in art market circles) to be a ‘better’ work. Its condition was described by the auction house as ‘very good’ with only a few hairline cracks, ‘inherent to the artist’s choice of media’. It was marked in the catalogue as ‘property of a private European collector’, in whose possession it had been since the 1970s — a healthy generation of ownership. 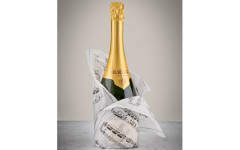 Further, its authenticity is more pristine, having appeared in the three Manzoni catalogues raisonnés of 1975, 1991 and 2004. Aesthetically the work is also more interesting: the more curving effect of the kaolin introduces a sense of movement that is less forthcoming in the later lot. Meanwhile, lot 60, made around the same time in 1958, was recorded as just in ‘good’ condition: as well as the expected hairline cracks, it had some shallow scratches, and it had received some restoration work (condition reports are not immediately available for works; they are not included in the catalogues and need either to be requested from the auction house or accessed through their websites via a password- protected login). The work’s provenance was less stellar, with no reassuringly bland-and-grand description of its consignor, although it had been in the same ‘private collection, Germany’, by descent, since 1968. And while it appeared in the 1991 catalogue raisonné and came with a certificate of authenticity, this wasn’t quite as secure a provenance as for the other work. Such differences were recorded in the price estimates — guidance on lot 13 was pitched at between £1.3-1.8 million; on lot 60 this was £700,000-£900,000. What in fact happened was that while the smaller, more significant work attracted healthy bidding and sold, as expected, for a hammer price of £1.6 million (£1.9 million once the auction-house premium was added), the second lot failed to attract any bidding and went unsold. Coming quite late in the sale was not to the second lot’s advantage (even the higher-profile evening auctions generally fizzle out after about an hour and are structured accordingly), and the fact that it followed two other unsold lots, both by Manzoni’s Italian contemporary Lucio Fontana, further dented the thinning saleroom’s appetite. But it could just as easily have gone the other way. 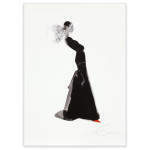 The deeper bidding for the first work could have stimulated interest in the second piece. This is, after all, a market in which even the weather has been shown to have an impact on people’s mood for art buying. The mathematical conclusion to this is that the average value of a Manzoni kaolin ‘Achrome’ work on 26 June was between zero and £1.9 million, namely £950,000. But such logic does not apply here: the reality of the market’s verdict was, rather, that one painting was worth £1.9m, the other was worth an unrealised amount somewhere below its unspecified reserve (and with no obvious bids in the auction room, it could be argued that its value was in fact zero). Each work’s price was determined by a variety of specific (and many unrelated) reasons that cannot be extrapolated. And there are arguably not enough similar works sold to smooth out such a range of results: eleven kaolin ‘Achromes’ sold at auction in the year to 30 June 2013. But if you are an institutional investor trying to work out whether or not to put money into art (or if you are the private bank manager trying to explain whether or not this is a good idea), there needs to be some way of pooling the available data in order to quantify the asset’s performance. So, and despite all the essentially unmappable characteristics of art, market specialists have spent much time and effort creating indexes that could (in theory) be compared to other markets. These all make considerable efforts to overcome the peculiarities of the art market. Some, such as Art Market Report (AMR), use average prices for art, smoothed over a period of time, to arrive at a trend line that reflects the general dynamics of a particular artist. 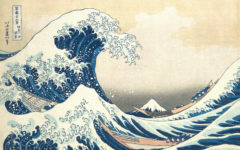 This can then be extrapolated into different segments of the art market (for example, Impressionism, 19th-century paintings) and the art market as a whole, and then be compared to external indexes such as a range of stock markets, the oil market and real estate — AMR even provides a ‘rugs and carpets’ index. AMR also enables users to take inflation into account or to cut out market outliers (such as the top and bottom 25 per cent of auction results) so that distortions are eliminated. Some of the more recently created indexes, such as the mathematical models used by Tutela Capital, have even built algorithms into their databases to try to incorporate the heterogeneous nature of the art market. The date of a work within an artist’s oeuvre, its material and even — somehow — artistic quality are measured in order to be able to evaluate their influence on prices. The German publication Manager Magazin produces one of the longest-standing barometers of Contemporary artists, the annual Kunstkompass (Art Compass), which began in Capital magazine in 1970. 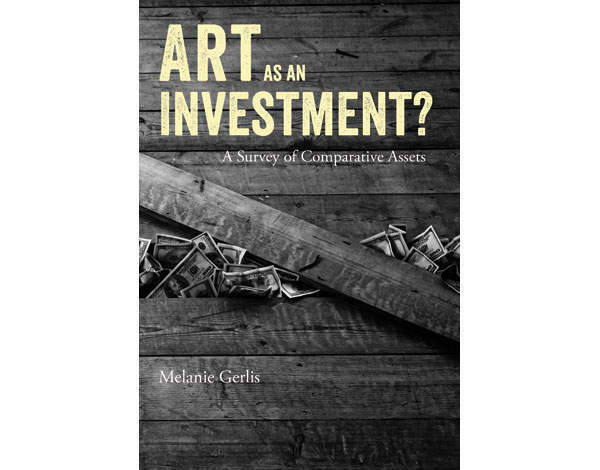 This takes into account variables including an artist’s exposure in gallery and museum exhibitions to determine an artist’s non-economic worth. In these instances, each characteristic essentially has its own market — but the number of examples in each ‘market’ is so small (often there is just one) that the effectiveness of extrapolating from such a system comes into question. This in part explains one of the more appealing measurements of art’s performance, and one that eliminates the problems of heterogeneity altogether, namely the Mei Moses family of fine-art indexes. Created by the academics Jianping Mei and Michael Moses, these extrapolate the market’s performance from the price difference between works that have been sold more than once at auction. 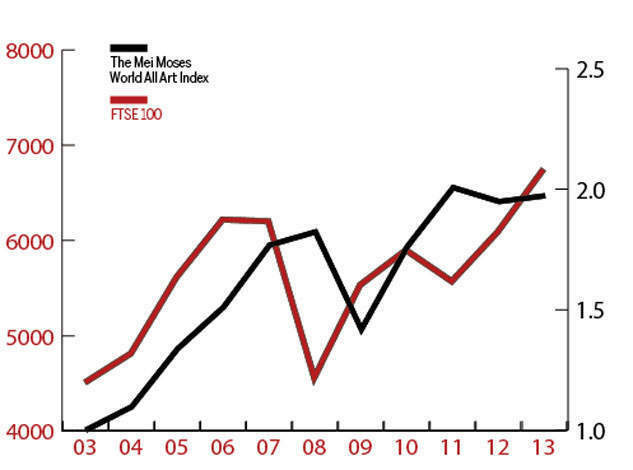 These indexes, in particular their World All Art Index (pictured below), are the ones that most regularly appear in financial publications such as the Economist and Financial Times. The repeat-sales methodology has a relative logic and transparency to it that is refreshing. Critics of the measurement system say, however, that this too is flawed: unsold works are not accounted for (although more recent data does take this into consideration, but bases the value of unsold works on their hypothetical auction estimates). Furthermore, the basket of goods is self-selecting as only works of a certain quality get sold more than once. Also, works more rarely come back to the public market at a level below their previous sale, as this sends too negative a signal, establishing a further bias to the data. However, and because Mei Moses fundamentally approaches works as individual pieces, it is one of the most relied-upon measures of art’s performance. The main problem is that even these academically and mathematically conceived indexes of art sales are built on data that is so limited and variable that they are like a tower built on very shaky foundations. Obviously there is some raw data that can be collated, and it certainly helps would-be investors to have some sort of context before they take the plunge to buy. But in the main, when the above indexes don’t contradict each other, they simply support empirical evidence. I have yet to come across a statistic or trend about the performance of either a market or an artist that is different from what I could glean from going to a certain number of auctions and art fairs per year, or even from reading about them. A decent rule of thumb is that an auction’s performance (and that of the market it is serving) can be assessed by comparing its total with its pre-sale estimate (taking into account the significant distortion that the results include the buyer’s premium and the estimates don’t). The proportion of lots that sold against the number offered is also a swift performance indicator. 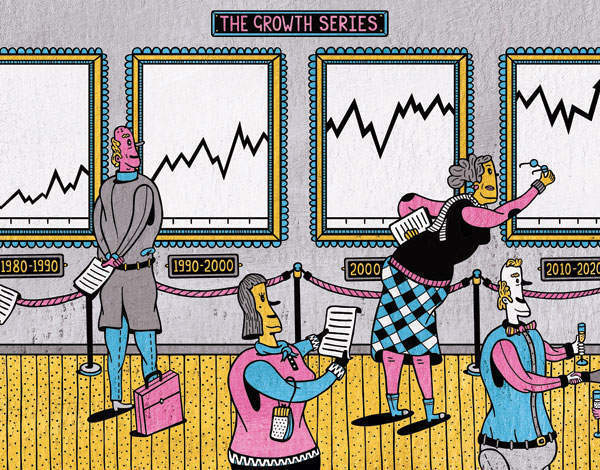 It is also helpful to back up hunches with what look like hard facts, via graphs and charts, and art-advisory firms include these in their swish-looking investment packs on the individual artists and markets in which their clients have an interest. But, while the Artnet database provides the best record of individual sales, it would be a push to advise anyone to pay the fees charged by the other, extrapolating services that build on its data. At the time of writing, Artnet’s ‘Analytic Reports’ cost $186 each for a document that tracks the performance of one artist’s work (such data is now free across several platforms for stock markets). This is the thinking behind the analyses provided by ArtTactic, an art-market research business, which includes ‘confidence data’, namely thoughts from people in the market (again, there is a subscription fee). Founder Anders Petterson is a regular at art market conferences, not least because his methodology is one of the more rigorous in the market (he has a background in finance) and because he doesn’t shy away from the fact that the art market is riddled with what he affectionately calls ‘eccentricities’. This, in part, contributes to a regular ‘confidence survey’, which takes the temperature of the art market, much like business surveys of chief executives, and from which some meaningful charts mapping market sentiment can be produced. This seems to chime with the surrounding mood, but, like everything in the art market, the data sample is limited. There are around 130 respondents, a mix of collectors, curators, art advisers and traders: compare this to the annual chief executive survey conducted by PwC, whose 2013 survey interviewed 1,300 business leaders. Capturing some of the art market’s visible upside has, since 2000 at least, been a preoccupying project for investors and those who serve them. While all would like to look at the art market using the same analyses and parameters as the more familiar stock markets, this is tricky to fulfil. Creating a watertight performance index is challenging, with even those at the top of this game fighting among themselves about their chosen methodologies. Attempts to rectify this have met with the stumbling blocks of limited available data, general transparency problems and the unique nature both of each work of art and the way in which it is sold. Furthermore, creating more homogeneous investment products out of art have failed to take off, lacking not only the ‘passion’ benefits that art can offer, but also the rigorous regulatory structure to which other businesses need to adhere. There are also, it seems, too few important listed art-related companies either to reflect or to offer outside access to the global art market. Broadly speaking, shares in developed market companies have been shown to offer investors long-term, above-average growth, liquidity and the reassurance of regulation, all accessible through trading on an organised financial market. With this in mind, it has always seemed implausible that unique works of art could ever replicate the millions of equally sized pieces of a company. Creating such investment properties out of art looks to be an uphill struggle. What Is The Tax Position If You Invest In Wine?